Liverpool fans have called for James Milner to extend his contract with the club following the news that Andy Robertson has penned a new five-year deal at Anfield. According to the BBC, the Scottish international has agreed a new long-term contract with the club that will see him stay at Anfield until 2024, news that will put smiles on the faces of all the club’s fans. 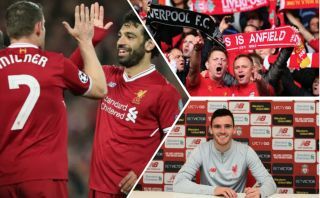 It’s not hard to see why Liverpool have decided to tie Robertson down to a new deal given the form the Scot has been in so far this term, and this news has seen Reds fans call for Milner to follow Robertson’s footsteps and agree a new deal with the club as well. Milner has been a key part of Liverpool’s side ever since he joined on a free from Manchester City a few years ago, and it looks like Liverpool fans are desperate to see the 33-year-old extend his stay at Anfield if the replies to his latest tweet are anything to go by. After congratulating Robertson on his new contract, fans replied to Milner’s tweet asking him when he’s going to sign his new deal and extend his stay at Anfield as well. Given how he’s performed for the Reds over the years, it’s easy to see why supporters of the club are see keen to see Milner put pen to paper on a new deal at Anfield! Delighted for this guy signing a new deal, well deserved ?? You staying then Milly ? You staying for a few more years? “We” “A few more years” is that a sign James? @JamesMilner Wouldn’t mind if you’d follow suit…. Sign yours next James ?